I opened the box and though "uh-oh... assembly".... I thought "here we go! Another obstacle to being healthier!".... I was WRONG!! Did you know this comes with it's own screwdriver??? There were count 'em 4 screws!! SO EASY to set up... No excuses... no "well I can't find my screwdriver so I'll just eat a cupcake instead"... No!! If you have trouble the note in the box gives you the contact number for the company CEO. I love it!! It's under my desk... OH!! AND THEY GIVE YOU FLOOR STOPS FOR YOUR CHAIR! These guys thought of everything... My first day and burned 381 calories when working on the computer... I also "cheated" and ate my dinner while using it. I mean, WHY NOT??? This little unit does everything it’s advertised to do. Keeps my legs moving while I work. Smooth moving. I did have to raise my keyboard because I needed more room to cycle. My Cubii was easy to assemble, and works very well. It helps keep me active even though I sit for hours every day typing. My husband was negative about it when he first saw it, then he tried it, and asked me to order one for him! It does move a bit after using it for a while: it angles, but does not move so much that I can’t use it. I’m glad I bought it and think it is a good product. Quality all the way around. This piece of equipment surpassed my expectations. From the VERY clear and readable instructions, to even including a scredriver for the minimal assembly required! It is well made, sturdy, not flimsy in any way. I am recovering from knee injury/surgery, and this is good low-impact exercise that gets my blood moving without hurting my knee any more. The low profile is great for using with chair while at table or desk. It is a bit heavy for me to take to work, so I use it at home. Even though a sturdy item, it doesn't take up a lot of space. Love the low elliptical! It is easy to set up and easy to use. The Cubii arrived and was easy to set up. I really like the smooth and quiet operation which makes it possible to keep pedaling and working at my desk. I would love a place to ask about replacing the digital tracker, which does not work. I have replaced the battery but it seems nearly impossible to get the tracker connected to the Cubii--it barely fits and doesn't seem to sit into the connecting module properly. That may be the problem. Many of us are in a sitting rut at work, which we know isn’t a good thing. 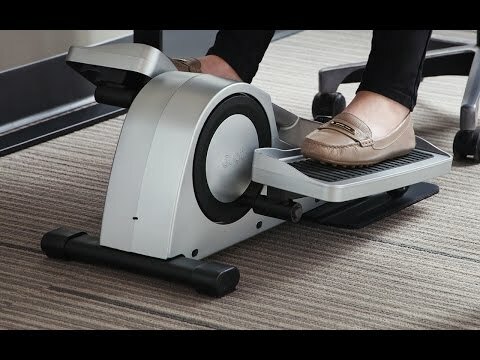 Cubii is an under desk elliptical machine that helps you stay moving, even when you’re seated. The design is minimal and lightweight. 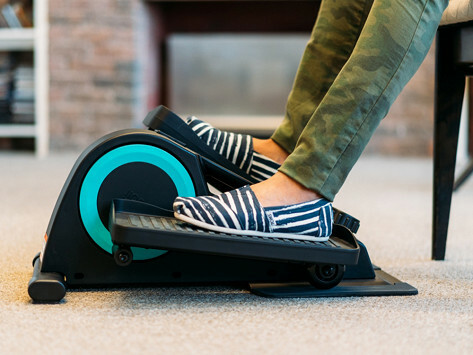 Unlike a standing desk, Cubii weighs only about 25 pounds and has a low profile that fits easily under a desk—no bumping your knees while pedaling. It’s quiet, too. The noise it makes is similar to white background noise, so it won’t interfere with phone calls or conversations. You can adjust the resistance to suit your fitness level. And Cubii has a companion app to track your progress, check on calories burned, and sync your steps with fitness trackers like FitBit.